Thanks to everyone who participated in my little giveaway! We got out five winners and I’m hoping (and fairly certain) we’ll have more giveaways coming up! So don’t despair if you didn’t win this time! Congrats to John in Connecticut, Kathy in Maine, Cathy in Massachusetts, Donna in Texas and Tom in Florida on winning the DVDS! Now the rest of this will be a little rambling…bear with me! I was out the other night with friends I’ve met through baseball (as many of you know, the Internet has brought many a like-minded group together!) and we were talking about how odd this year’s World Series win has been. Odd in that it feels almost natural. One friend commented on where she planned to go for the “next parade”. And it wasn’t said with any sense of entitlement and when she said it she acknowledged that it was crazy she could even feel that way. I’d say the majority of friends I’ve made through our united love of baseball and the Red Sox are in their forties or older. That is to say, they’ve (we’ve) seen a lot of lean years in our baseball fandom and for those of us who are Boston sports fans, our sports fandom in general. Heck the Celtics were all we really had to keep us going for quite some time and even they had 22 years between their two most recent championships. So far, it’s been my experience that this time around Red Sox fans aren’t doing the things they did in 2004 (or even 2007). Sure everyone seems to have a championship t-shirt or pennant or maybe they picked up the Sports Illustrated special issue…but you don’t see fans clamoring to be saturated with Red Sox World Series memorabilia the way we were in the past. Maybe this is our version of “acting like we’ve been there before”? I know for me the three World Series wins I’ve seen have been markedly different. 2004 was emotional. For all the older Red Sox fans and players who never saw or never thought they’d see, a World Series Championship banner go up . I spent the day of the 2004 “rolling rally” watching from home, sobbing like a baby. In 2007 I really felt like it was for me…us….and all I wanted to do was party. So I went to the parade with two friends and we spent the day celebrating. It was a blast, if not a bit of a blur. This year I almost didn’t go to the parade because of things going on at home and was talked into it…and I’m glad I was. It was, again, a blast, but it was different. I spent more time looking, really looking at the team and thinking about what it must mean to them. So many of them a bit older than the average player and now they will forever be labeled “champions”. 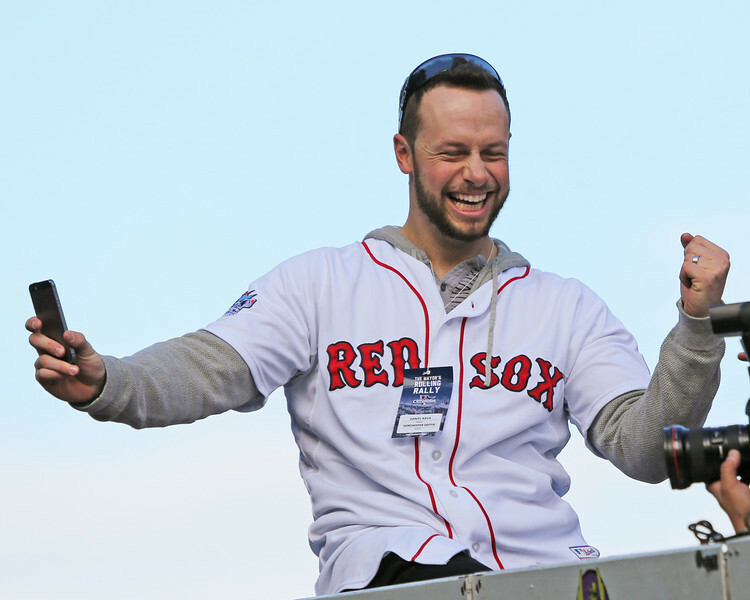 One of my favorite baseball stories ever being Daniel Nava, undrafted and eventually “purchased” for $1 by the Red Sox (turning into $1500) is now a member of a “World Champion” baseball team. How wonderfully ridiculous is that? Even though the likes of Bill Maher will have you think what happened in April wasn’t that big of a deal (or that there was no connection to the Red Sox and their fans), thinking back on how dark Patriots Day became (after being so happy about a Red Sox walk-off win) and seeing the Red Sox bring the World Series trophy to the finish line of the Boston Marathon felt like the perfect way to end this season. And I will admit to feeling just a bit of attitude while standing on Boylston Street on the day of the parade, up against the barricades that lines the streets on April 15th. There is nothing that will make up for what happened at the Boston Marathon and no number of trophies or parades will bring back the lives lost and devastated by the bombings but there is a part of me that felt like the Red Sox reminded us this year that no matter how terrible things are…it’s still okay to be happy. So thanks for making us happy, Red Sox!